Was Climate Change Responsible for the Decline of Mayan Civilization? If you entertain in your mind the phrase, “History repeats itself”, then, you might want to focus on something that can really prove that history does repeats itself time and time again. We have learned all about the rise and fall of the ancient Mayan civilization. They were once a group of people who were considered to be the most progressive population during their time aside form, of course, the ancient Egyptians. The ancient Mayans have contributed significant legacies to the world ranging from architecture, farming or agriculture and even science, mathematics, logic and infrastructure, to name a few. During their time, it seems that these people were destined to be the super nation up to the present time. Alas, they vanished! There was a time that they just disappeared without a trace, with the flick of the switch, with the breath of the wind. 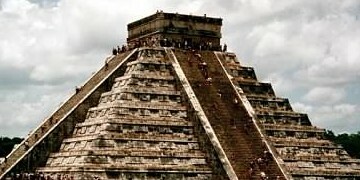 Many people believe that the ancient Mayans self destructed by their own practices. They figuratively killed themselves by going head-on with progress but never realized to themselves that by doing so, they were slowly decaying and destroying their civilization. The Maya built a lot of structures to cater to their increasing populace. They cut down trees so that they can use those trees to burn limestone and use the burnt limestone to build pyramids, houses and other structures. By looking back at what transpired with Mayan civilization, we can witness history repeating itself especially in today’s world. We are also the same mistakes the ancient Mayans have made. Another thing that can point out that history repeats itself is the climate change that the ancient Mayans experienced during their heyday. We can consider them the “pioneers of everything” until around 6th century A.D. By 900 A.D., after which, most of the great stone cities of the ancient Mayans were totally abandoned. Many historians believed that during their time, the ancient Mayans exhausted the environment that surrounded their cities up to the point that it could no longer sustain a very large population. According to scholars and historians, another factor which may have led to the demise of the Maya was the constant warring between competing city-states which led to complicated military conflicts resulting in general breakdowns of society and social order.. There were many reasons for the rise and eventual demise of the ancient Mayans. One thing is certain, climate change and deforestation were significant factors. Hopefully, modern civilization can learn much from what happened to the ancient Mayans. Now, we can see that will remind us that there were once a great nation are these Mayan artifacts and other archaeological findings. Will future generations and civilizations one day look back at our monuments and artifacts, and judge us by our own self destruction? Each of us can make a difference protecting our environment and civilization for future generations. ← Were The Ancient Mayans From Another World?